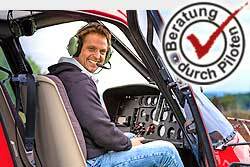 Please observe the following rules of conduct in your helicopter flight. For questions please contact the pilot on site. We wish you already enjoy your flight. Smoking, flames, and dangerous goods are forbidden. Watch out for loose items. Supervise your children and animals. .
Keep a safe distance from the helicopter until the pilot or flight assistants instruct you. Approach on request and keep visual contact. Approach the helicopter from the front or side, never from the rear! When boarding or alighting from the valley side always bend over! Remain buckled up during the entire flight. The doors should be opened and closed only by personnel, except in emergencies. In an emergency: Keep calm, release seatbelts, open the doors and and leave the helicopter. Contact emergency services. Communicate through the headphones. Inform the pilot promptly if you experience any physical discomfort. Pack walking or trekking shoes and warm clothes for mountain tours. Mobile phones are permitted - you are more than welcome to take photographs and videos. Enjoy your flight!